PILAS Liverpool 2013 will include the first PILAS poster presentation space & all attendees are encouraged to submit a poster proposal. We think it may be of particular interest to those who are just beginning their postgraduate degrees & perhaps haven’t completed enough research to give a paper. Of course, those presenting a paper are also encouraged to present a poster at the conference. The space will be informal & friendly; the emphasis will be on finding links between different research projects on Latin America. Below, PILAS President Sarah Parry, describes her experience of poster presentations. “In 2012 I participated in two poster presentations in which I showcased my research in a visual format. 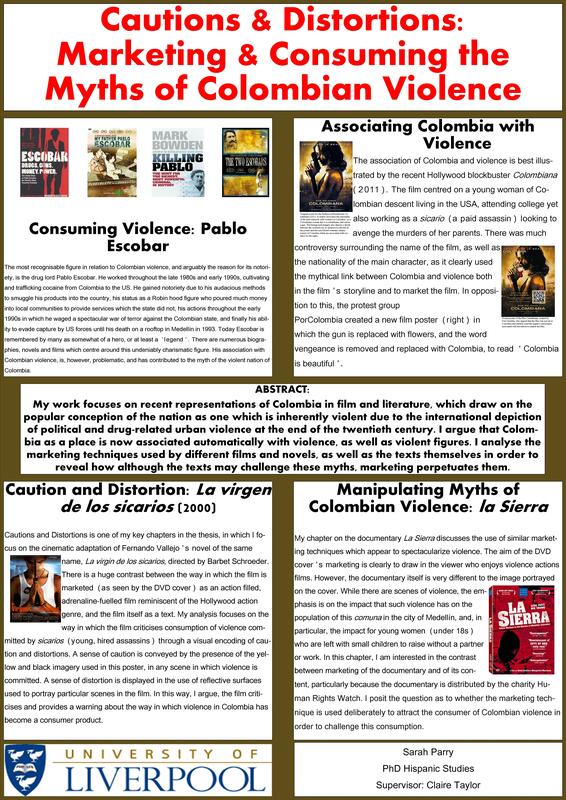 My posters were very different: one focused on a particular chapter that analyses the Colombian film, La virgen de los sicarios, the other on my research as a whole. I would say that in my experience, the most successful was that which communicated my PhD project as a whole as it helped others to identify links in their own research with mine. I find poster presentations to be a very different experience to that of giving a paper. Papers very often focus on specific aspects of our research topics, whereas posters allow us to communicate the general research questions on which our projects are based. Poster presentations are more informal and much less intimidating than giving a full paper. The environment fosters relaxed discussion, and I personally have made a number of contacts through presenting my posters. Guidance on how to design a poster as well as creating them using different computer packages is available on the PILAS website. All posters must be portrait, size A1.